Vote in head-to-head matchups with The Escapist community to pick your Reader's Choice for best game of 2013. The discussion comes up every year among us gamer folks - what is the best game of the year? We throw out words and phrases like "replayability", "wow-factor" and "just plain fun", as well as pull out all the stops in displaying our console fanboyism or PC elitism. In addition to arguing about which game deserves the mantle of the 2013 Game of the Year on the forums, this year The Escapist will let you vote for your favorite games in head-to-head competition in our Reader's Choice Game of the Year Bracket. Starting on November 27th, you can even fill out your own personal bracket, guessing which games you think will make to the last round. If you accurately predict what the community picks, we'll give you a year of The Escapist Publisher's Club. We've picked the 15 games you guys have been talking about the most and put them on the bracket. And because we figured there was going to be a game you guys absolutely wanted to vote for but that we didn't anticipate, the last spot is being voted on by the members of the Publisher's Club right now. So that's it, 16 of the best games of the year will go head-to-head in four rounds of competition. The first round will begin voting on December 4th, and each week you'll get a chance to vote for more games before you whittle the competition down to just two games on Christmas Day. The winner will be announced on January 1st, 2014. For those of you unfamiliar with bracket tournaments, game titles will be matched up against one another for one week of voting. Feel free to use your social pull on Twitter or Facebook to get votes for your favorite game to make sure it advances to the next round. Whichever game gets the most votes from the community will be declared the winner of that round, and then will be matched up against the winner of another head to head matchup. 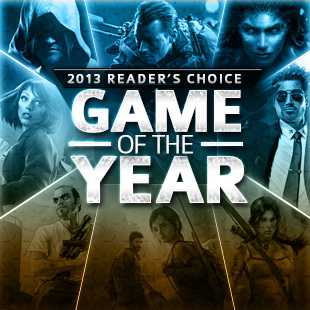 January 1st - The Escapist Reader's Choice Game of the Year 2013 announced! Want to know what the 16 games you'll be able to vote on? We'll announce them next week when the last slot is decided and you get to start filling out your bracket. Of course, that doesn't mean you can't start discussing your picks in the comment thread below, or on Facebook. Get your pitchforks ready! The Escapist 2013 Reader's Choice Game of the Year will be in the hands of the mob, and it is up to you to incite it. Stay tuned for more information coming next week.